Green Bay’s Running Back Situation is Getting Clearer. 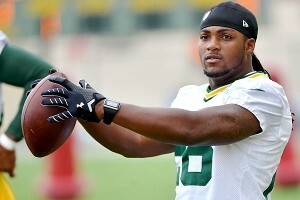 GREEN BAY–The Packers have likely lost running back DuJuan Harris for the season to a knee injury. Following practice on Tuesday, Head Coach Mike McCarthy announced that Harris would be placed on the injured reserve list. “He’s a young player I felt would be an impactful player for us on offense. It’s a tough blow for him. DuJuan was a big part of my individual focus for the season,” McCarthy said, referring to Harris and second-round draft pick Eddie Lacy forming “1-2 punch format” in the Packers backfield. In last Friday’s loss to Seattle, Harris reinjured the knee that had kept him out of the first few weeks of training camp. The Seattle game was Harris’ first game back. He had flashed his trademark quickness in practice last week and there was talk of Harris and Lacy being complements to each other in a re-tooled running attack. “What happens in Kansas City will say a lot about the remaining players in that group,” McCarthy said of the Packers running backs. McCarthy spoke prominently of veteran James Starks and Alex Green. “It’s a long year. You need them all,” McCarthy said. Down goes Dujuan Harris, James Starks has looked awful, as has Jonathon Franklin. So Eddie Lacy you are the man! I mean this makes sense we used a 2nd round pick on him so I think he should have been the starter out of the gate. Dude can pick up the blitz and run over a linebacker, he is going to be a beast! If Lacy is able to read the zone blocking holes this offense will be unstoppable, imagine the Packers with a legit play action pass? It has to scare defenses everywhere. P.S. My Packers Predictions are coming the weekend keep an eye out!